If you would like to link to us you can use any of the code samples below, just copy and paste into your links page, thanks! Electronic on board diagnosis (EOBD) is fitted on all modern cars. Find out here about EOBD scanners, fault codes, sensors and get help diagnosing your car. 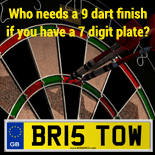 Number Plates and Show Plates, the largest selection and choice in Europe! Framptons make the largest range of classic car and motorcycle number plates in the UK. Spark Plugs & Ignition for Veteran, Vintage and Classic engines. Whether it is for cars, racers, lorries, motorbikes, stationary engines or even vintage lawn mowers the Green Spark Plug Co. has vast stocks of period plugs and/or their modern equivalents. These sections provide a range of free tools that will allow you to calculate a rough estimate of how much UK service jobs should cost. The number of calculators is building fast so check back here regularly for new tools to use. Providing brake pads for performance cars such as sports cars and the motor sports industry. A guide to companies in the private number plates industry. Best Buy Tyres sell low-cost car tyres online. Get an instant quote in minutes. Expert fitting centres throughout the UK. Secure online store for alloy wheels, body styling, towbars and car audio. Parking Sensor Kits from £49.99 with FREE next day delivery. UK based car parts online store, Over 60,000 Performance car parts and car accessories from all the top brands. for Buying & Selling Sports, Prestige, Unusual Cars & Superbikes. Putting the exotic in motoring! www.win4now.co.uk - Win cash, holiday, electronics, gifts. Bizsmall.com - Business directory, > Online resource and information. Car Rental Worldwide - A specialist directory of providers of car rental and auto rentals from UK, France, Spain and Worldwide. Fetchthebest is a completely independent online insurance search engine, designed to save you time and money when it comes to reviewing your insurance. Fetch, the dog, will not only endeavour to find you the most competitive quotes but also provide you with all the information required to make an informed choice on which policy best suits your needs.